Gave one of these a quick test the other night. Seems to work much better than the Note 3 and detected the ring pretty quickly, without me having to use the control app to find the SweetSpot. Repeated a number of times is succession, with no failed reads or problems. Confirmed working fine without a case on. Will test with a case when the testing device has one! (It's not my phone). Any possibility of a picture of the back showing the sweet spot, @Chris ? 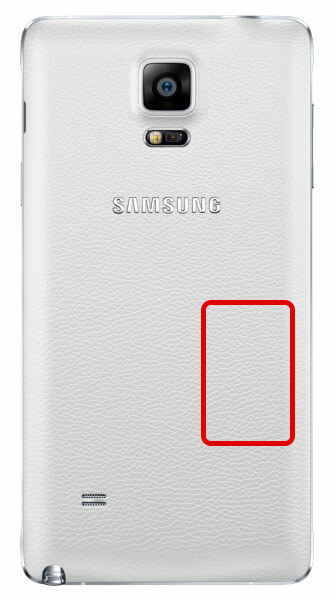 I have a Samsung Galaxy Note 4, and I use an official 'Galaxy Note 4 LED Flip Wallet'. I would like to know if this NFC ring works with my mobile phone and with this particular protective case. Also, where are the 'sweet spots' on this phone, especially with the case on? Sorry this took so long, the sweetspot on my Note4 is right around here shown in the image below. I've been blown away by how good the antenna matching is with this device actually. It picks up the rings from nearly a centimetre away without a case on and works flawlessy with a thin case on - one of those silicon/plastic wraps that have a type of covered card on, that folds over the phone. Constantly amazed by how good it is!